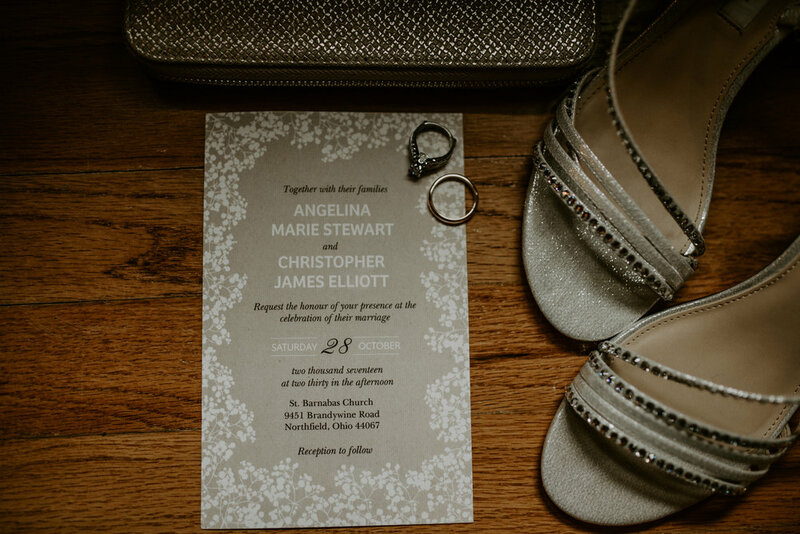 Incorporating small personal details into your wedding makes it unique and special to you. Whether it’s jewelry, shoes, cufflinks, a hairpiece, or a letter, each item holds a piece of value. Having those photos really embraces the tone and theme of your wedding day. Some of our couple’s favorite photos are the detail shots that are captured throughout their day. They help tell your story. Details are one of my favorite things to capture. Sometimes the small stuff is overlooked by the centerpieces and the dresses. But the details are the beautiful accent pieces that bring everything together and make it yours. The lace belt you made from your mother’s wedding gown, the letter your spouse wrote you before you walked down the aisle, or the cuff links that were your grandfathers. - These things touch your heart and make you remember what’s important. These are the moments and details that matter. Let's talk about the importance of hiring a professional wedding photographer for your big day, as opposed to letting a friend with a good camera do it, leaving it to your guests or hiring a photographer that specializes in something other than wedding photography. We hear all sorts of horror stories from people who chose those avenues and are forever stuck with less than amazing wedding photos. In today's blog we're going to discuss 8 reasons why you should hire a professional wedding photographer to capture your favorite moments at your wedding. As wedding photographers, we wanted to point out a few specific reasons to hire a professional photographer, and have no regrets on your wedding day. 1.) Great photography is about more than a fancy camera. It's about knowing the camera. It's about knowing which settings will produce the best results in the current environment. Often times a professional wedding photographer has spent years of schooling, courses, workshops, and experience perfecting their craft to bring you the absolute best results on your wedding day. 2.) The advantage of being a wedding photographer for so many other couples, is that you tend to develop a "sense" of how the wedding day will develop. Even as things go a little "sideways" a true professional photographer knows how to get things back on track and moving smoothly. Not only that, but that same sense allows to you accurately predict when things like a stolen kiss, or a hidden glance are going to happen. 3.) Professional Photographers know how to work in tricky lighting. As we walk into a room, we instantly size everything up and our potential camera settings are racing in our heads... even sometimes when we're not working. Quick adjustments like that are the difference between beautiful wedding photos, and "well, we remember how beautiful that was..."
4.) There are a RIDICULOUS amount of emotions that come up during your wedding day. There's been a lot of stress building up to this day, and we recognize that sometimes this manifests itself in unexpected ways. We know how to deal with moms who are a little overwhelmed, the dad who just realized that later today he'll be giving away his daughter, or the groom who is going absolutely crazy not being able to see his bride yet! 5.) A non-professional wedding photographer doesn’t typically carry backup gear with them, a professional will. What does this mean for you? Put simply, it means that if anything goes wrong with one camera then they will always have another one with them. It also means that they will know what to do if a memory card corrupts or if the battery runs out they will always have a spare one. Because these are not cheap, a non-professional typically has not invested in extras. 6.) Stuff Happens. What if your friend is ill on your wedding day? Will they have someone they can call in an emergency? A professional will have a network of photographers and 2nd shooters they can call upon in an emergency. 7.) A non-professional photographer won’t have insurance. What if something goes wrong and they cause an accident? What if they accidentally back into a candle and burn down your venue? What if one of your guests breaks their new camera. 8.) At about 2/3 of the weddings we shoot we have an "Uncle Bob". Uncle Bob is that well meaning family member who brings their DSLR in hopes of getting a perfect shot of the bride in her wedding dress. Uncle Bob tends to stand in the middle of the aisle, step directly in front of the photographer and videographer, and raise in camera up out of the crowd perfectly in front of your photographers' shot. A non-professional photographer, or a photographer that specializes in something other than weddings might be phased. A well-seasoned professional wedding photographer has likely learned how to tactfully and yet firmly ask Uncle Bob to be aware of their actions. I recognize that some of these things might seem a little far fetched, but there's a very real story behind each and every one of these points. Yes, I know that it's sometimes hard to justify the cost of hiring a professional, but looking back on your day trust me - it's worth every penny! And remember, an hour after your wedding you leave the venue, the food get thrown away, your flowers wilt, and there's one thing left to keep your memories alive and bring happiness to you regularly.... your wedding photos. Where can we begin? We are so happy to have met these two beautiful souls. We were so excited when they contacted us after attending their friend's wedding (Tommy + Maureen) to see if we were available for theirs! Laura + Brandon were married at an intimate ceremony in front of close family and friends in Kensington, Maryland at the Garrett Park Town Hall. It really was the perfect day for an outdoor wedding. They had so many personal touches to their wedding, you could just see them reflected in their big day. Brandon wrote Laura a special note on the bottom of her shoe before she walked down the aisle. We love the choice of dress for the bridesmaids, such perfect dresses for a more casual backyard wedding! Laura's Cuban heritage was reflected by her gifts to her bridesmaids and the guys' guayaberas, which are traditional wedding shirts in Cuba. We couldn't get enough of their contagious laughter throughout the day. There were so many touching and emotional moments. Definitely one of those days where we realize how fortunate we are to be wedding photographers. We had SO much fun at their Maryland wedding - let us know what you guys think in the comments below! Styled shoots usually revolve around a theme like “Travel Inspired Garden Wedding” or “Bohemian Elopement in the Woods.” They're coordinated by a vendor (usually a planner) that reaches out to other vendors that can contribute their services (ie. bakers, florists, calligraphers). They use their time and resources to make everything look perfect. Some even have models that act as the bride and groom or part of a wedding party. So why write this blog? And why don't we participate in styled shoots? This article isn't intended to bash vendors who work on styled shoots. I think styled shoots for other vendors (non-photographers) are kind-of brilliant. Hair and makeup artists, florists, rental companies, calligraphers, graphic designers, bakers and more get to show off their talent and creativity. I am in awe of what some of these vendors come up with. But as a wedding photographer, it's kinda cheating. Styled shoots are basically fake setups where you can control exactly what's happening. If you've ever been in a wedding party, you know that weddings are notorious for being unpredictable. It's easy to photograph a model couple with the perfect details. But that. isn't. real. Shawn and I love being wedding photographers because we love capturing raw emotion. We love little details because we love the sentimentality behind those details. Everything at that wedding represents that couple and tells their story. And how can you recreate the tears that come when a groom sees his bride for the first time? Or the laughter when grandpa busts a move on the dance floor? Those are the reasons we're wedding photographers. Those are the reasons that keep us going to wedding after wedding. We feel it's a real honor to be a part of a day so personal. All of the photos on our website, albums, and welcome magazine are of real couples. Those photos demonstrate our ability to capture a wedding with real people and real emotions. Which is what you want in a photographer, right? You gauge a photographer's ability by his photos of past weddings. After this blog, you'll never have to wonder if our past weddings are real or styled shoots. "Oak & Honey Events provides planning and design services for weddings, social and non-profit events. Our packages are structured at three different levels - full planning and design, partial planning and design, and wedding management. Our Wedding Management package is similar to a month-of planning package but we begin approximately 6-8 weeks before your event to handle the logistics and allow you and your family to relax and enjoy every moment of your day. We’re also experts at helping you find creative ways to reduce your wedding’s impact on the environment, like locating green vendors for your invitations, venue, catering, floral design, photography, and more." What tips would you recommend to brides to help them have a more stress-free day? "Our number one tip for our brides before their wedding is to take every moment in and remember the day is about you and your fiancé. We also recommend putting your trust in your wedding professionals and that they can help make your day run smoothly." What would you say is the biggest advantage of having a wedding planner? "The biggest advantage of having a wedding planner is you and your families get to enjoy your wedding day! At a minimum, having a Wedding Management package helps ensure the details will be handled by your planner so you don't have to worry the weeks leading up to the wedding and the day of. Oak & Honey Events number one goal for our clients is to provide a stress-free and fun planning process for our clients." "We look at all wedding professionals as a collaboration team for all weddings. We always match our clients with wedding photographers who we feel match their budget, personality, and style. Before the wedding, we reach out to the photographer to talk through the wedding day timeline and make sure we have the amount of time the photographer would like to capture the day. On the wedding day, we stay in contact with the photographer to make sure everything is running smoothly and sometimes assist with getting family photos done efficiently after the ceremony. After the wedding, we check in with the couple to make sure the day ran smoothly with all vendors. We also work the photographer to determine if it is a wedding to be submitted to publications." One point we always bring out to our couples is that having a wedding planner allows all the questions of vendors (including wedding photographers) to be directed to the planner. They are our point of contact - so instead of having multiple people going to you for answers or direction, everything is taken care of by your planner! You want to enjoy your day - and you want your family to enjoy your day! Hiring a wedding planner can make a huge difference, a positive one, for one of the most important days of your life. You're purchasing something that you won't be able to see for weeks after your wedding. Let's not overlook that a wedding photographer is not (or shouldn't be) cheap. Often times your photographer is one of the top three costs of your total wedding budget. You've likely never gone through the process of choosing a photographer and aren't entirely sure what to look for. In a previously-written blog I covered questions that you'll want to consider asking potential photographers when making your decision (you can find that blog here). In this blog post, I'm going to cover a big topic: Questions you should ask YOURSELF before you ask a photographer anything. We're big believers that the you really need to "click" (no pun intended) with your photographer. After all, you are choosing to hang out with this person the WHOLE TIME on your wedding day. Knowing what it is that you're looking for will make meeting with potential photographers less awkward, more efficient, and most importantly - will result in a much better choice in the end. Here's a few questions to get you thinking. 1. "How important is photography to us?" - Especially when compared to other aspects of your wedding. As mentioned above, wedding photography is statistically one of the top three expenses in your budget. Assigning a sentimental importance and value to your wedding photos will help to assign a monetary budget allotment to them. Once you understand exactly where you stand with the answer to this question, you'll be able to start narrowing down your photographer choices. 2. "Exactly what do we want from a photographer?" This is a question that I will usually ask couples when we meet face to face. Because we place such an importance getting along with your photographer, it's important that we understand exactly what it is that you hope to have gotten from us at the end of the day. Some couples that we talk to stress that they want a friendly person that will fit in with their bridal party throughout the day. Others say things like: "Our parents want to make sure that we take a lot of posed, 'traditional" photos (definitely not our style but we're happy to comply). This question is powerful because when you know the answer it will instantly disqualify some of your potential choices. 3. "What style of photography are we most drawn to?" There is no standard style in photography. Period. Take a minute to notice the style (posing, color scheme, lighting, etc.) of photography that you are most drawn to. Every once in a while you are scrolling through your Instagram feed and you're forced to stop because you've stumbled on a beautiful wedding picture... that's what I'm talking about. Because styles vary from one photographer to the other, recognizing the style that you like the most will help steer you in the right direction. 4. "Who is involved in the decision making process?" Not only do you have the ideas and opinions of both you and your fiancé(e), you likely also have ideas and opinions coming from well-meaning family members and friends. Ultimately, though, we like to emphasize that your wedding day is about you. Hopefully these questions will take you down a path of wedding photography self discovery. Having reflected on these things will leave you feeling confident and prepared! Knowing specifically the type of wedding photographer that you're looking for will greatly increase the odds of finding your PERFECT wedding photographer! Sarah & Ian chose a gorgeous day to take their engagement photos - how beautiful are those leaves? We love when a couple chooses a location that's sentimental to them - Sarah & Ian chose the Towpath in Cuyahoga Falls, Ohio - a place that they often ran and hiked at together. Ian was constantly making Sarah laugh and you could see how much they were in love. Be comfortable. While engagement sessions with Belle Moreau Photo typically last about forty-five minutes, we may be walking a bit, standing, and sitting in places you usually don’t. Be complimentary. You and your guy don’t need to perfectly match. But your level of style does. If you’re dressy, he needs to be too. If you're more casual, you get the point. A great rule of thumb is to have complimentary colors. Remember the color wheel from art class? Colors that are across from each other are complimentary. If you’d like to add a third color into your outfits make a triangle across the wheel. (yellow, blue, red) Another way to be complimentary is with your skin tone! If you have lighter skin, light colors can wash you out. Be simple. Mixing patterns can be tricky, and they can distract the viewer to your outfits more than you. If you’re wearing a pattern, have your guy in a solid color, or vise versa. Be aware. Where will your photos be taken? If they’re more in a natural locations (think garden, park, etc.) a neutral color palette will be perfect. If you’re going for a more urban vibe, a pop of color would be more fun! Another tip: dress for the season! We will be outside and while cute is important, being warm is more important. Tennis shoes & t-shirts. Sorry guys, but these are just too casual. Baggy clothing. Make sure your clothing fits well, and is tucked in with a belt if it is on the loose side. You want to avoid looking lost in your clothing. Bright colors. If you want to incorporate a pop of bright color, do it sparingly. Usually fluorescent colors reflect on your skin and can look weird. Crazy hair and makeup. Make sure you are still you! Getting your hair and makeup done can make your photos look beautiful, but make sure they reflect your style. Need a recommendation? Just ask! I have connections with hair and makeup artists who would love to make you look beautiful for your session.